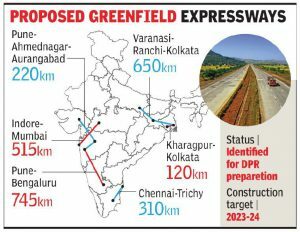 Govt targets building 4000 km greenfield roads & 3000 km expressways under Bharatmala 2.0 programme. Higher speed limit maximum of 120 kmph on expressways. Sources said that the target date for rolling out these roads totalling around 4,000 km under the Bharatmala phase-II would be 2024. Considering that forest and wildlife clearances hold up projects for years, the NHAI has asked the consultants to avoid road alignments through national parks and wildlife sanctuaries, “even if it requires taking a longer route/ bypass”. Similarly, the consultants have been advised to incorporate provision of separation of local traffic, especially for vulnerable road users (VRUs), for longitudinal movements and crossing facilities through viaduct(s) located at convenient walking distance.